Tip: Chicken skin tends to cause flare-ups in the broiler, so be sure to remove it. In a 1- to 2-quart saucepan, whisk together the ketchup, maple syrup, molasses, vinegar, chipotles, Worcestershire sauce, dry mustard, onion powder, and garlic powder. Bring to a boil over medium heat, reduce the heat to low, and simmer gently for 15 minutes to meld the flavors. Set aside. In a small bowl, combine the paprika, sugar, garlic powder, onion powder, chipotle powder, 1-1/2 tsp. salt, and 1/2 tsp. pepper. Arrange the chicken on a baking sheet, sprinkle both sides with the spice rub, and pat gently. Cover with plastic wrap and refrigerate for 2 to 3 hours. Position a rack about 4 inches from the broiler and heat the broiler on high. Line the top rack of a broiler pan with foil and slit or puncture the foil at the openings to allow fat to drain. arrange skin side down on the pan. Broil for 5 minutes. Flip the chicken with tongs (rearranging them if the broiler heat isn’t even) and broil until they’re barely pink inside when cut into, 4 to 5 minutes. 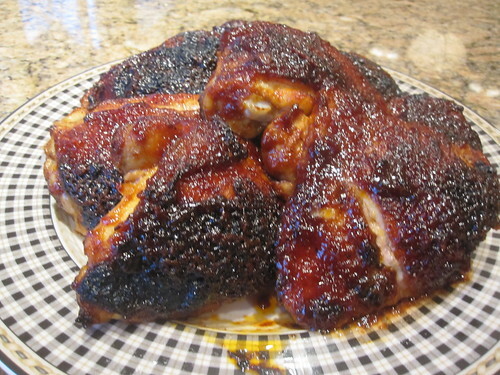 Brush the chicken with some of the sauce and broil until the sauce begins to caramelize, 1 to 2 minutes. Flip and brush the chicken with more sauce; broil until they’re just cooked through (165°F), and the sauce is nicely caramelized, 1 to 2 minutes more. Transfer the chicken to a clean platter and let rest 10 minutes before serving. making this for supper always delicious!! you got me in the mood for this, going to make it over the weekend. Yes, it really is fabulous and brilliant to use it on ribs, let me know how that comes out. Today I did it the lazy way. I roasted my chicken with the spice from this recipee. I also made the sauce for those who want to dip their chicken. Brilliant idea Linda, some days we just need the lazy way and I am sure it was just as good.